of exploration. On our Adventure tour we use the scenic village of Megalo Papingo in Zagori as our base. From there, we set out to go hiking, horseback riding on beautiful mountain trails, river trekking and rafting down the impressive Voidomatis and Arachthos rivers, rappelling in one of Tzoumerka National Park’s most scenic river gorges, all while exploring the picturesque mountain villages of North Western Greece. Upon arrival to Athens, you’ll be transferred to your hotel in the center where you’ll have time to unwind and relax for a few hours. Late afternoon our guide will meet up with you and you’ll embark on a 4 hour guided walking tour of the capital’s historical center. You’ll visit the Parliament, the National Gardens, the Kallimarmaro Stadium, as well as the Theater of Dionysus, the Roman Auditorium, the Agora. 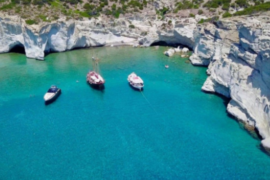 You’ll be able to explore the world famous neighbourhoods of Plaka, Monastiraki and Thission and enjoy stunning views of the Acropolis hill with the Parthenon, among others. We’ll sample local delicacies, learn about the history of this ancient Metropolis and above all immerse ourselves in the culture. Provided there’s time we strongly urge you to visit the New Acropolis Museum before or after your trip. In the evening we’ll head to a traditional Greek restaurant, right in the center of Athens where we’ll experience authentic Greek cooking at its very best. After a hearty breakfast, we leave Athens behind us and head west towards Corinth. 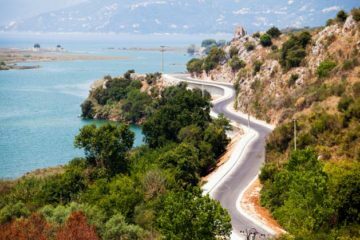 We’ll stop by the Isthmus canal for sort visit and photos and continue towards the Rion bridge, connecting northern and southern Greece. Passing by Messolonghi, Greece’s first capital city, and home to an incredible ecosystem of well kept wetlands, we head further north towards Ioannina, Western Greece’s largest city. A place with rich history, an important financial and cultural hub in Byzantine times and the center of the Greek Enlightenment during the Ottoman Period, the city is built on the hills around lake Pamvotis. Here you may allow some time to stretch your legs by the lake and walk around the 15th century castle of Ioannina, the city’s fortified old town. We’ll also have a chance to savor delicious local desserts, like kataifi and baklava, as well as traditional pies filled with chicken, beef, cheese or spinach. No matter what your preferences are when it comes to fillings, the numerous bakeries around the town’s center deliver unforgettable culinary experiences. From there it is an hours drive to the mountain village of Megalo Papingo in the area of Zagori, which is going to be your base for the rest of the week. This day is dedicated to river rafting, horseback riding and hiking. After breakfast, we gear up, grab our paddles and board the boats. We spend the next 2-3 hours going down the turquoise waters of the Voidomatis river, passing through an amazing landscape of diverse tree species. About halfway through, we leave our boats for a while to do a short hike to the small Byzantine church of Agioi Anargyroi. The Kleidonia stone bridge marks the end of our river adventure. Once there, we have a midday break by the river banks and head back to Megalo Papingo. Depending on the water levels, we have the opportunity to river trek back to the rafting starting point. Early evening, we saddle up and explore the green valleys and slopes around our base on horseback. For the next few hours we gallop through stunningly beautiful landscapes, guiding our horses through mountain trails. If horseback riding isn’t your thing, we can arrange a cooking class, where you’ll learn how to make dough, open “fylo” and bake in a woodfire oven a traditional pie, using centuries old techniques. This day is dedicated to getting to know the scenic traditional mountain settlements that have survived for centuries in this part of the country. Villages full of history, unique architecture and distinct, yet delicious, local cuisine, abound on both sides of the gorge. 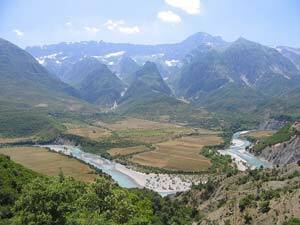 An hour drive through the National Park takes us to the eastern mouth of the Vikos gorge and the village of Monodendri, where we enjoy magnificent morning views of the gorge from the Oxia lookout point. From there, we head towards the village of Kipi, where we have a chance to admire and walk across the stone arch bridges of Plakida, Kokori and Misiou, built centuries ago by exceptionally skilled local stonemasons. Our next destination is the village of Vradeto, where a short hike to the top of the gorge brings us to a natural balcony overlooking the valley within the gorge. There, we have plenty of time to unwind at an altitude of over 1600m, before we head back to Papigo. Once there, we’ll have a chance to visit a local farm, where we’ll be able to get hands on experience with a farmer’s life in the mountains. You’ll get a chance to milk animals, put on a beekeeper’s suit and harvest honey from beehives, and learn about the ancient culture of the Vlahi people, the area’s semi-nomadic tribe, who have been living off the land in these mountains for countless generations. 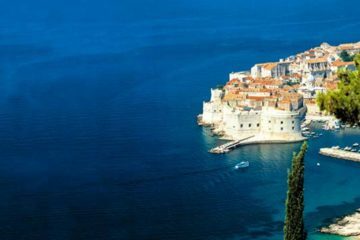 This day presents you with a chance to trek through the World’s deepest gorge as listed by the Guinness Book of Records. The trek through the Vikos canyon is a highlight of any trip to this part of Greece and an amazing experience for nature enthusiasts. Early in the morning our trekking guides will drive you to the village of Monodendri. There you will buy some snacks for the trek and start walking down the path to the canyon’s base. Crossing the gorge is a 5 to 6 hour trek, walking along the banks of one of the Voidomatis River tributaries. Under the shadow of Vikos’ steep cliffs you will have a short break for an energy snack, before you continue trekking towards the springs of the Voidomatis river. Voidomatis is one of the cleanest rivers in Europe and its water is potable. From there you will head up, towards the village of Vikos or back to Megalo Papingo, depending on the route your trekking guide will choose to take. Upon arrival at Papigo, you may spend your evening to take a rest after a long day of hiking at one of the natural swimming pools of Rogovo. Early morning we leave Papingo behind and head south towards the Tzoumerka National Park, a place of amazing landscapes, unique flora and fauna and relatively unexplored when it comes to tourism. 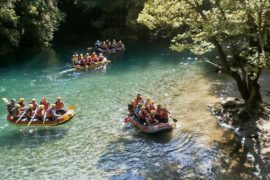 Here you will experience rural Greece at its finest as well as one of the best rafting routes in Greece! There are waterfalls, caves, gorges and canyons as well as hike trails with varying scales of difficulty, enough to keep everyone excited. We have two options when it comes to outdoor activities. We can go water rafting down the Arachthos river or go canyoning in one of Tzoumerka’s beautiful waterfall gorges. After our picnic lunch by the river banks, we visit the village of Syrrako, a protected 16th century settlement up in the mountains that are renowned for its traditional Epirotic architecture and aristocratic history. From the village of Syrrako our route by the banks of river Kalarritikos, takes us to the traditional village of Kalarites and the isolated 13th century Monastery of Kipina, that is hanging from an almost vertical cliff. Leaving Tzoumerka behind on the last day of your trip, the downhill drive towards Central Greece passes through heavily forested areas and green valleys, leading you eventually to a Unesco World Heritage site and one of the highlights of every trip to Greece: The gravity defying Orthodox Monasteries of Meteora. The name Meteora, which translates into ‘suspended in the air’, is given to the only 6 surviving 14th century monasteries, built on the tops of unique rocky cliffs. 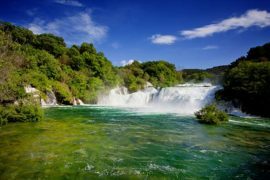 Our guide will take you on a hiking tour, an opportunity for you to learn more about the history of one of the most striking natural and cultural sites in Southern Europe. That day you will spend your night at the village of Kastraki, in the foothills of Meteora and the shadows of the high cliffs. After Breakfast you will check out from your hotel and drive back to Athens. It’s a five hour drive along the national highway and we’ll be making a brief stop at Thermopylae (the Hot Gates) to pay tribute to King Leonidas and his 300 Spartans. The coastal town of Kammena Vourla provides the perfect backdrop for an afternoon lunch by the sea. In the evening we’ll be back in central Athens and our adventure will end.